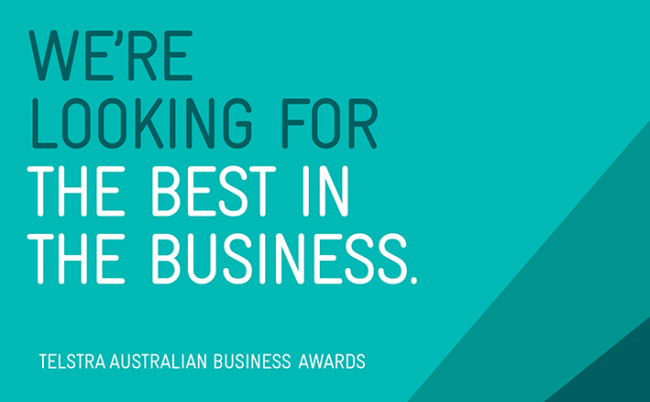 easyEMPLOYER awarded as one of Telstra’s 2012 Business Award Finalists!We are proud to announce that HRMWEB/easyEMPLOYER was named a finalist in two 2012 Telstra Business Award categories: “People’s Choice” and “Small Business of the Year”. We are particularly chuffed to be a finalist in the People’s Choice category as it relied on voting by the public for the business that they wanted to support. Many thanks to our clients and their staff who voted to get us over the line and into the finalist group! The official awards dinner was on Friday the 27th of July. We were so excited to be in a room full of really great small businesses all celebrating their hard work, dedication and success! We had nearly our entire team there for the big gala and it was great to spend a fabulous night out with everyone. It was exciting to see how many of the finalists in all categories were family run businesses – we always knew Canberra had an abundance of businesses run by families but this really came to light as each finalist thanked their family members for being a part of their business success. A big thanks from HRMWEB goes to all of our friends, family, clients, partners and supporters. It’s been a great ride up until now and we can only see good things to come as our business grows, our client list grows and we scale up to get ready for what’s coming over the next couple years. Thanks to everyone who sent messages of support to us on the night of the Awards dinner. « easyEMPLOYER delivers the right “cure” for Chemists!